A Wolf Spirit is a creature connected to werewolves. The Wolf Spirit is presumed to be the source of the power and the curse that werewolves bear. 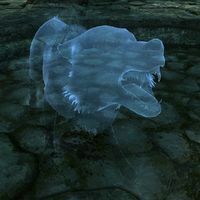 Curing lycanthropy requires throwing the head of a Glenmoril Witch into the Flame of the Harbinger in Ysgramor's Tomb in the presence of the werewolf to be cured. Doing this releases the Wolf Spirit from the werewolf's soul, which must be defeated in order to cleanse the person. This page was last modified on 20 June 2017, at 11:41.